This fanedit combines the best aspects from other TPM fanedits along with the faneditor’s own concepts/edits to create a definitive version of “The Phantom Menace”. To combine the best aspects from other TPM fanedits along with my own concepts/edits to create a definitive version of “The Phantom Menace”. -No Jar-Jar ‘Tarzan’ yell when jumping in the lake. -Sidious’ lowered voice and obscured face really strengthen his menacing, phantom-like threat over the Republic. -The Gungan-city scene was handled perfectly! It still feels weird, because you know what the original was like, but it flowed so perfectly. Excellent job! -Boss Nass’ tics have been completely removed. -No Jar-Jar stepping in poo, and no Jar-Jar bout with Sebulba. Another great cut. -Anakin’s fight with Greedo was a great addition. -Jar-Jar’s pod-test antics completely removed! -Instead of completely removing Fodesinbeed Annodue (the two-headed announcer), he should have been trimmed down, at best. The introductory scene to the pod-race now feels weird, as if everyone is greeting the crowd for no reason whatsoever. -It makes no sense for the Tusken Raiders to shoot two podracers without any difficulty, only to miss several Jawa’s repeatedly. -Anakin’s introduction to Obi-Wan, and the following scene between Anakin and PadmÃ©, could have, and should have, been cut. -Anakin’s scene with Amidala should have been cut. The smirk on Anakin’s face when he thanks Amidala is too much to bear. -Again, this editor claims to have removed Anakin’s autopilot sequence, yet here as well, Anakin tells R2 to “override it”. If there were no autopilot, what could he possibly override? This sequence seems to be overlooked by every single editor. -Anakin’s ‘Angel crap’ dialogue could have been cut too, although it serves as a stepping stone to Anakin’s later feelings. So, okay, not too bad. -Jar-Jar’s bumbling in Watto’s store couldn’t possibly have been left out, due to Qui-Gon’s “we’re leaving” bit, but again, no hard feelings there. -The build-up to the original midichlorians could have been dropped altogether, although going from the pod-test scene to Darth Maul would have been too much of a good/evil contrast. -Jabba the Hutt’s removal was spot on. This was another one of George Lucas’ “special cameo” appearances, and served no purpose whatsoever. No hard cuts, no mid-sentence cuts, no hard fadeouts, or anything of that kind. Static menu with fanedit trailers of Episodes I, II and III. The fanedit trailers were a nuisance, to be honest. JasonN is a great faneditor, but should get help when it comes to creating Fanedit titles and trailer texts. “Every history has a past”? By definition, history is everything that took place in the past. It doesn’t make any sense. Furthermore, those lines kept being used in all three Episode trailers. It made everything fall apart. 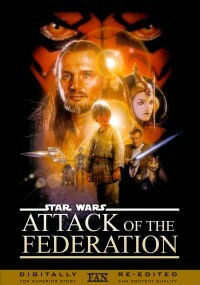 In my opinion, the films could use better titles than “Attack of the Federation”, “Twilight of the Republic” and “The Black Knight Rises”. Even though it could do far better by removing all remarks listed under ‘The Bad’, it still deserves merit as the best Phantom Menace edit released so far. Jar-Jar’s antics have been severely reduced, Palpatine’s identity as Sidious has been hidden, as it should have been, and Boss Nass is no longer a spastic twit.